Metals of Africa (ASX:MTA) has done exactly what it said on the tin. This junior explorer has consistently produced high grade graphite drill results, in search of a maiden JORC resource estimate. Now, this JORC graphite resource estimate is expected to be announced in the coming days at MTA’s Montepuez Central Project. Once announced, the resource estimate will allow the wider market to fairly judge MTA’s current approximate $10M market cap against its much larger peers who also have a JORC resource in Mozambique. Direct neighbour Syrah is currently capped at $707M, meanwhile Triton is capped at $70M. Depending on the resource size, once the JORC resource news breaks, we could see a swift share price movement from MTA. It is likely would-be investors are waiting on this news. At the same time, success is no guarantee here – this is speculative exploration. In addition, Mozambique as a country has particular political and social risks which can hinder projects from advancing. With its assets located in Mozambique, MTA remains a high risk stock. As well as the JORC resource expected to land in the coming days at Montepuez, MTA is drilling continuously at its other Mozambique graphite play – the Balama Central Project. Keen graphite enthusiasts may recognise ‘Balama’ as it’s the name of the very resource that Syrah holds. This is a 1.15 billion tonne resource at 10.2% graphitic carbon – one of the largest in the world. 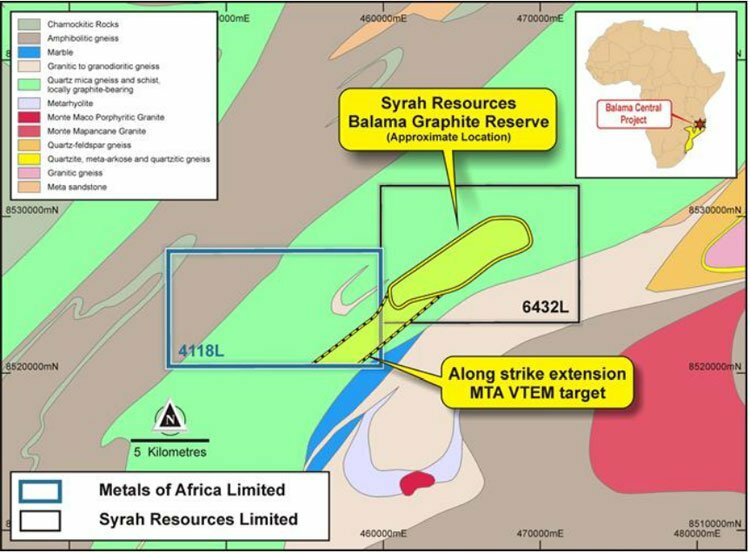 MTA’s Balama Central Project is immediately next door to Syrah, and drilling is being undertaken at what may be the extension to Syrah’s already identified monster resource. 12 shallow holes for a total of 1000m will be plunged into this ground over the coming six weeks – adding to the newsflow and potential for uplift for MTA. Strong graphite intersections will only boost interest in this company in the short term. The company recently confirmed an oversubscribed $3M placement, which will fully fund the work describe above. MTA is exploring for graphite in the most graphite-rich location on the globe – in fact there is more graphite in Mozambique than the rest of the world combined. Balama Central Project – where MTA is drilling now and over the next six weeks, right next door to Syrah. 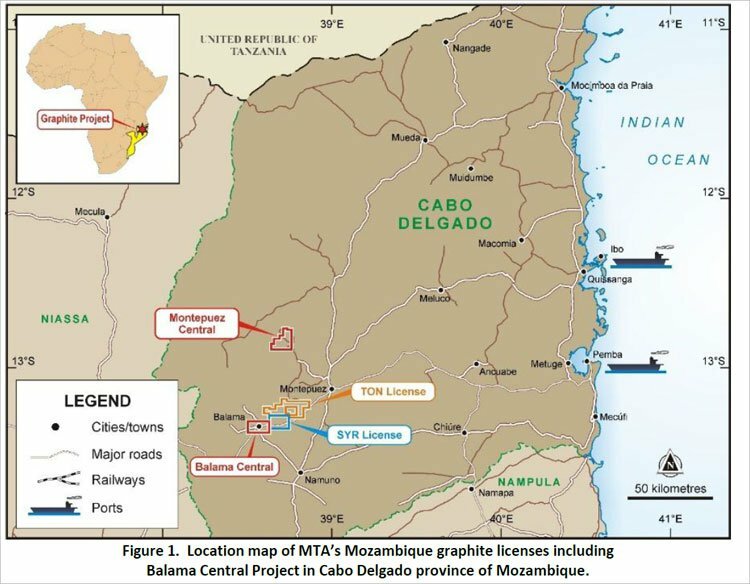 Location of MTA’s Mozambique graphite licenses including Balama Central Project in Cabo Delgado where the recently discovered Lennox Prospect sits. Let’s find out a little more about each of them. Over the past 12 months, MTA has been busy drilling on the Montepuez Central project, targeting three key prospects: Lion, Elephant, and Buffalo. In total, MTA has drilled more than 60 diamond holes for 6450m over the past 12 months, with the exploration schedule reaching full capacity between July and October this year. 1m @ 10.0% TGC from the Buffalo Prospect. The cores were taken at shallow depths, which ultimately will mean easier and more cost effective mining. All exploration data gathered will form the basis of MTA’s imminent JORC resource. The working strategy has been to define a near surface, high-grade graphite resource at all three prospects. 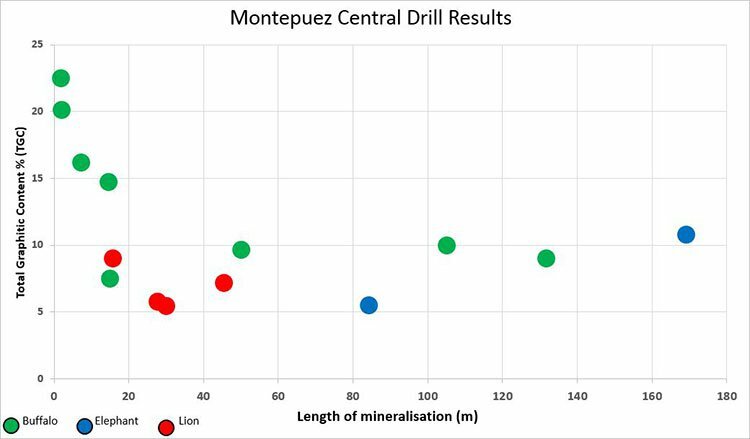 Lion is the least drilled of the three prospects, but enough has been done to inform a JORC resource estimate once it has samples independently analysed at a laboratory in Brisbane, Australia. Buffalo meanwhile, brought up graphite flakes averaging more than 0.1mm, which is classified as large to jumbo. Overall the TGC ranged from 5% to 15% across MTA’s prospects in Montepuez Central. While its Montepuez Central Project is progressing, MTA has kicked off drilling at its Balama Central Project. This is yet another catalyst for the Company which has the potential to re-rate the stock in the near term. Bear in mind, however, that this hunt is in its early stages and professional advice should be sought when considering MTA as an investment. At Balama Central, MTA is on the hunt for an extension of the same graphitic schist defined by Syrah Resources (ASX:SYR). Syrah will start producing from its Balama Project in the first quarter of 2017 – which should bring increased attention to the region. MTA’s ground is directly next door to Syrah’s, with both likely sharing the same type/grade of mineralisation below the ground. In fact, MTA believes that a 3km extension of SYR’s deposit may well run into its own permit. MTA’s geologists made the call based on an airborne VTEM survey which has been backed up by high grade mineralisation at the surface, with all the technical hallmarks of Syrah’s deposit. That VTEM survey also provided clues about where exactly to drill – which MTA has commenced with the aim of defining yet another JORC resource next year. 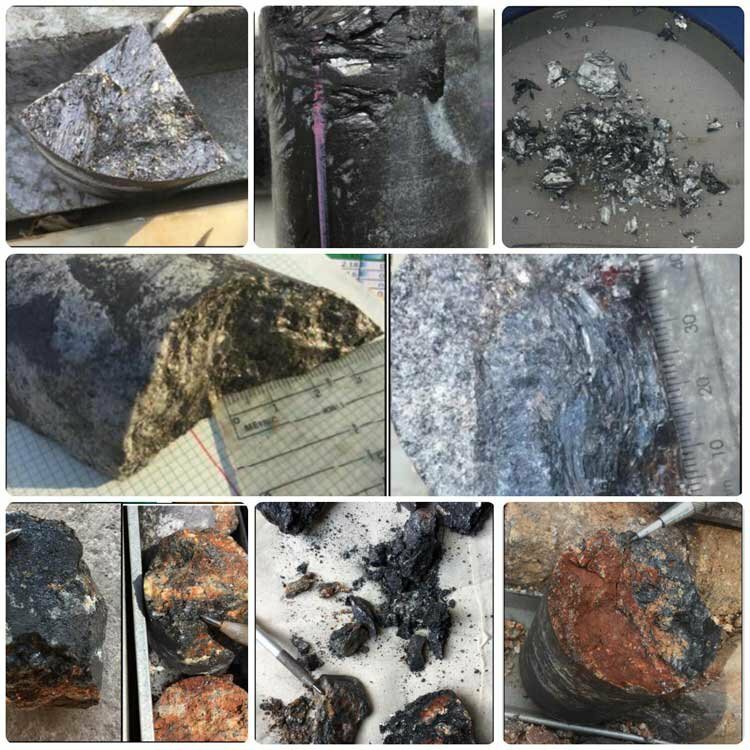 Based on MTA’s initial observations and pitting, Balama has so far produced encouraging graphite and vanadium samples that warrant a dedicated full-scale drilling programme similar to the one just completed at Montepuez Central. Samples indicate up to 17% TGC graphite at the surface following a 400m x 200m, 12 exploration pit pitting programme. Just as a reminder of what MTA is playing for, the global market for graphite is roughly $15.06 billion according to a P&S Market Research report on the subject . The market is tipped to grow by 4% until 2020, with a global supply/demand imbalance thought to be about 1500 tonnes in favour of suppliers. The market demand for the material is being driven by a number of factors, but is thought to be down to an increasing appetite for lithium-ion batteries. Already, around 80% of graphite used in batteries was for the lithium-ion variety . The batteries power a number of consumer good electronics such as cameras and phones, but also electric cars. The end-user market is looking rather alluring from MTA’s perspective, given the recent graphene test results received by MTA . According to independent testing, MTA’s graphite from Montepuez can be processed into graphene and is comparable to synthetic graphene from a quality perspective. Globally, it is estimated that hundreds of millions of dollars are already being spent on graphene research and development, with patent applications mushrooming over the past few years , according to the ‘Intellectual Property Office’, based in the UK. Funding for metallurgical work and the impending Pre-Feasibility Study has been secured through an oversubscribed placement raising $3M, which welcomed two new significant shareholders. Of particular interest to MTA investors, is the investment made my Mr. Navin Sidhu, Group CEO of Allgreentech International Plc., (AGT) a major international resource investment company based in London, UK. One of AGT’s major subsidiaries is Malaysian Mega Galvaniser (MMG), a large galvanising company based in Malaysia which is also an end-user of zinc. At the same time as a zinc end user invests in MTA, MTA’s zinc project in Gabon is also progressing and could add another value layer here. Last but not least, MTA’s commercial potential has been further scoped up to include rubies. A tidy JV deal with ‘Mozambican Ruby Lda’ (MRL), sees MTA cede 75% of its non-core ruby project, in exchange for handing over exploration to MRL. The deal could open up early cash flow for MTA and is a factor that shouldn’t be ruled when looking at the value in MTA. MTA is hastily advancing its prime project in Mozambique (Montepuez Central) with a keen eye on a second, not too far behind – Balama Central. A JORC resource is already highly anticipated at Montepuez in the coming days, which may well lead to an immediate re-rating of MTA’s valuation. Of course, like all small minerals explorers in Africa, investing in MTA is not without risk – MTA may not uncover commercial quantities of graphite. But on the other hand, with drilling results indicating grades up to 33.8% TGC and jumbo flake size, MTA could outshine its larger peers via a more premium product, one which may be cheaper to extract due to its shallow depth. Regardless of the size of resource MTA manages to secure, exploration is ongoing and a Pre-Feasibility Study will soon be initiated at Montepuez, and potentially the Company may look to go straight to a pilot plant capable of generating early cash flow here. Once a maiden JORC resource is confirmed in the coming days, MTA has strong potential to close the valuation gap with its peers and competitors, Syrah and Triton. Remember, Syrah is currently capped at $707M while Triton is capped at $70M. There’s plenty of catch-up room for MTA who are valued at only $10M, and yet, are playing in the same ball park as much larger companies at a further stage of development compared to MTA.